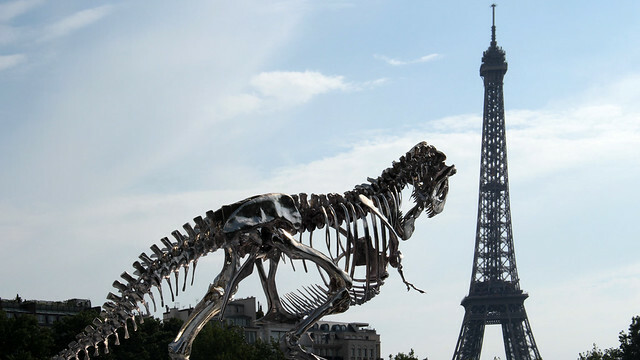 Some amazing photos have surfaced online of a full-scale T-rex sculpture in Paris and encouraged by Mags to check it out (met with an enthusiastic yes by Jesper to search for it together), I headed down along the River Seine to Pont d’Alma yesterday evening. 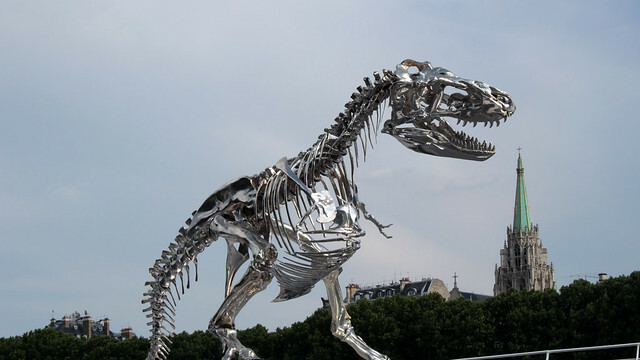 The T-rex hunt was made easy thanks to mentions of Bateaux Mouches on some of the photos because otherwise, it would be bloody hard work under the hot sun. 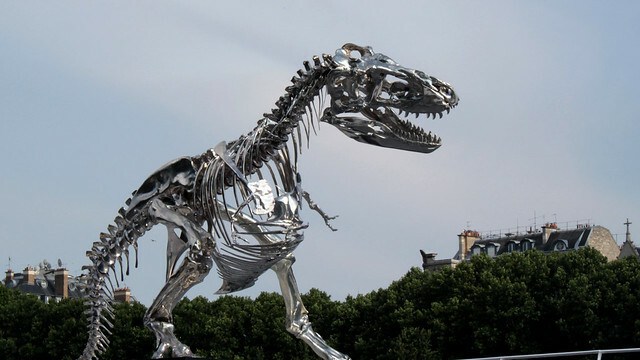 This chrome dinosaur is, how do I put it, not exactly soaring over the River Seine. 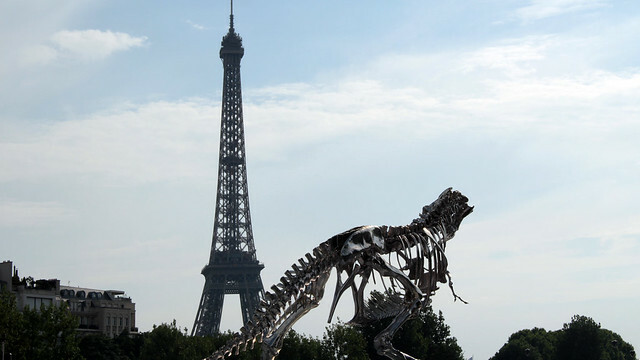 French photographer Anthony Gelot had done a phenomenal work in capturing the beauty of this sculpture by Philippe Pasqua along with *the* Parisian landmark, there’s no doubt about it. 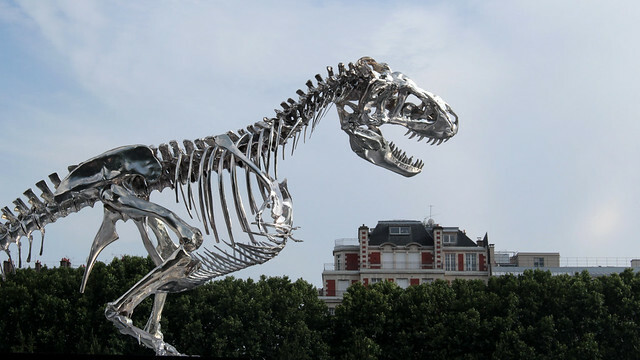 However, the articles I’ve read with hyperbolic claims along the likes of “larger-than-life installations”, “soaring” and “towering” had me expecting something epic. On seeing it in person, I mentally kicked myself for not managing my expectation better. 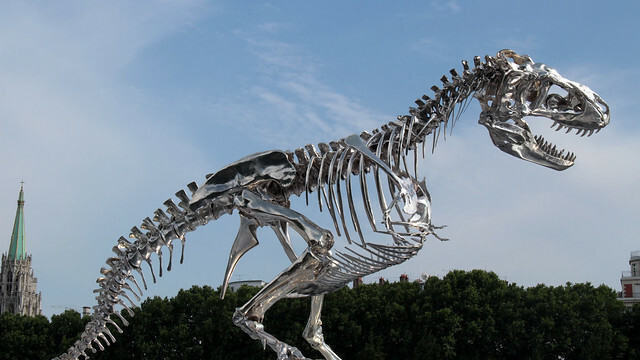 At a frame size of 3m by 6m, it’s safe to say I have seen many more magnificent real skeletons of T-rex (including Sue in the Field Museum, Chicago) and this pales in comparison. Nonetheless, it made an interesting subject to photograph and we started clicking away. This installation is not specifically on a public space but the deck of the docked ticket station of the Bateaux Mouches. We can therefore only photograph it from the footpath (with a height difference of about 1.5m), unless we pay for tickets to join one of their cruises and access the deck which is used by the visitors as waiting lounge. Bummer. I am considering returning to the spot at a different time, perhaps later in the evening so there will be more colours in the sky. It will be highly unlikely that I’d manage to reproduce what Anthony Gelot has created, but I could still have some fun trying, not to mention taking the opportunity to learn how to handle F’s new camera better in such setting. We’ll see. Do you think I’ll be able to persuade a staff member to let me on the deck for a few minutes without purchasing anything?